Curiously, Genesis attributes the downfall of humanity to something identified only as The Tree of the Knowledge of Good and Evil. 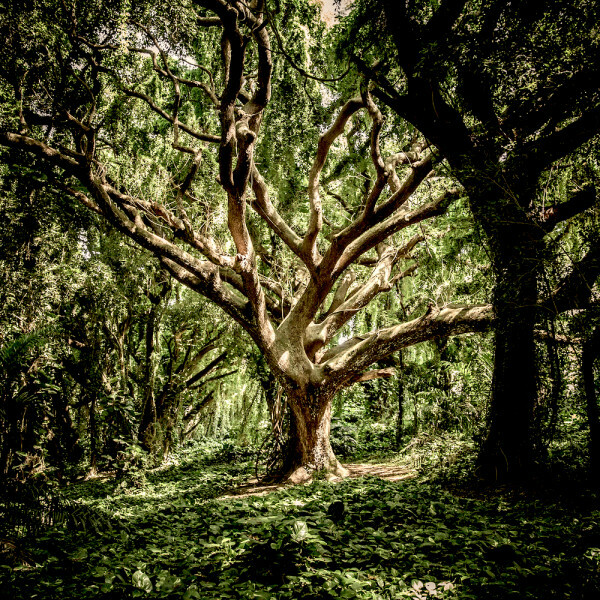 This mysterious tree is the one thing in all of creation forbidden to humans, and yet it is growing at the center of the garden of Eden—and in some ways, at the center of the biblical story. What is this story even talking about? Let’s step back. There are actually two trees in the story, the first of which is the Tree of Life, and the second of which is the Tree of the Knowledge of Good and Evil. What should be immediately obvious is that these are the twin attributes of divinity. Any deity worth its salt is primarily distinguished by these two factors: immortality, and the knowledge of things beyond understanding. These trees weren’t The Tree of Life and The Tree of Death, as if they represented a good and an evil choice. Rather, they were the Tree of Life and the Tree of Knowledge—two good things, two characteristics of God. God had already made his intentions clear. Humanity was created to be like God, to do the sort of work that God does: to create and cultivate life, to name and categorize creation. And so these two trees were not hidden away from humankind—but planted directly within reach. And yet, God forbids humans to eat from the Tree of Knowledge. Why? Many people have imagined God playing some kind of elaborate trick here. Perhaps God is forbidding something, just so humans will have the option to disobey him. Maybe God wants humans to experience pain and evil, just so he can teach us a lesson. Maybe this is why he forbids something, and then puts it tauntingly within reach. I think the answer is simpler and much more straight-forward. And not nearly so insulting to God. We must picture the first humans as children—if not physically, then mentally or emotionally. In comparison to our own jaded outlook, they were innocent and uncomplicated. They were not ready for the weight and responsibility of all the knowledge that was available. We routinely play out this exact scenario with children. We protect them from knowledge until we deem them ready to handle it. We tell them not to go places or do certain things, or even read about certain subjects, until they’re older. We understand that it takes time for people to process certain information, to grow into a mentality large enough and stable enough to grapple with some of the more difficult aspects of life. When this protective boundary is breached too early, it can lead to lasting trauma. I think this is what Genesis is telling us about human beings. Humanity is a species that grew up too soon. Humans were made in the image of God. We were intended to participate in both the life and the knowledge of God. Apparently, we were intended to have the life first, so that we could grow into our ability to handle the knowledge. But we took the knowledge first, and became intensely traumatized. We took possession of the knowledge of God before we took possession of the life of God, and we have been experiencing the consequences ever since. We could not give back the knowledge. We could not unsee what we had seen. And so humanity emerged into the world as a creature before its time: a creature with godlike knowledge and power, a creature which could control nature and reshape the world—but a creature struggling under the weight of that responsibility, traumatized and weighed down with a sense of shame and brokenness. In the Genesis account, God sees the trauma humans have undergone, and decides we aren’t ready to grapple with the responsibility of immortality as well. So he sends humans out of the garden, and locks that aspect of divinity away. As the story has it, we cannot go back, we can only go forward. And so God sets out, not to take us back to Eden, but to help us grow to the point where we can handle the knowledge we have been given. Only then, will we be able to possess both the knowledge and the life. Bro, his is a stellar take on the narrative in Genesis 3. I agree with the frameowrk you are using about Adam and Eve not being ready. The etymology of evil is conceptually wrapped in notions of deficit, lack, deprivation and privation. I thiink part of what happened when they ate the tree of knowledge of good and evil is that they became aware of their being incomplete as it relates to the proces they were intended to participate in. This, coupled with the very act of choosing to go against the command to not eat that tree, derailed them from the developmental track they were on. At any rate, this is a great paradigm you are working from, IMO. Arguing about the Bible What is Identity? God Does Not Belong to Anyone An open letter to the non-egalitarian Churches of Christ Baptism and Eschatology and 70 AD The meaning of the word "God" Christianity is a set of memes Women in the Church Ancient Israelite Violence and The Morality of Roadkill Did Jesus Create the World? Or did God?